Screen printing is a printing process where a mesh is used to transfer ink onto a substrate, except in areas made impermeable to the ink by a blocking stencil. A blade or squeegee is then moved across the screen to fill the open mesh apertures with ink. A reverse stroke is then used to cause the screen to touch the substrate momentarily along a line of contact. This causes the ink to penetrate the substrate and be pulled out of the mesh apertures as the screen springs back after the blade has passed. 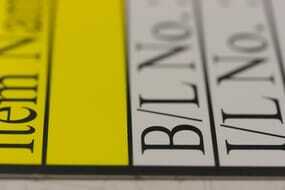 Domed labels are printed pressure-sensitive labels that have a thick, dome-shaped clear polyurethane coating. Companies often utilize screen printing on domed labels to increase their branding and marketing potentials. 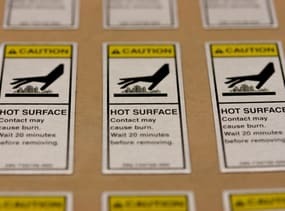 In addition, custom screen printed domed labels are utilized by a wide variety of equipment and machinery that is often used in rugged outdoor environments. Our custom screen printing on domed labels provides the protection your domed branding labels require to keep them intact and looking good. Metal objects can often be tough to print on, no matter the process. However, our screen printing on metal method allows you to create custom screen prints for nameplates, front panel graphic overlays, warning labels, and metal front or rear panels. Our custom metal stamp and screen printing on metal capabilities provide a clear and detailed message that can be easily understood. Screen printing is the best product decorating option when a large, bold image is required for a flat plastic part or when a full wrap or two-sided image is required for a cylindrical plastic part, including bottles, buckets or jars. Through the custom screen printing on plastic process, we can print plastic parts at nearly 360° in one pass. With these machines, multicolor images are also achievable, requiring one pass for each color. We can also screen print on clear, frosted or colored plastic parts. Nameplates offer a unique and professional way to display the names of employees, companies, office inhabitants or for labeling specific areas. Custom printing on nameplates creates a personalized touch that will be appreciated by both the employee and client/customer. In addition, we also have the capabilities to provide screen printing on nameplates that will be suitable for extreme weather and/or temperature environments. Hot foil stamping is the process of applying a pigment or metallic foil to paper using a heated die. The die presses the foil onto the surface under pressure, leaving the design of the die on the paper. There are numerous ways in which a custom foil hot stamping can be used including business cards, brochures, presentation folders, greeting cards, note cards, invitations and more. The added benefits of custom foil hot stampings include greater brand perception and attention-grabbing effects, which can lead to an overall increase in business. Contact us for more information regarding our screen printing capabilities, or request a quote for an in-depth price analysis today.